ATA vice chair and Ron Crouch Transport MD Geoff Crouch. The Australian Trucking Association (ATA) says the newly-launched Prime Minister's Veterans Employment Program can help in resolving the trucking industry’s ongoing driver shortage problem. The initiative is designed to offer former Australian Defence Force (ADF) personnel employment opportunities in the private sector. It involves mentoring ex-service staff to transfer their ADF skills to private jobs, with government helping them to gain access to health and training records, and the Australian Public Service Commission developing a toolkit and resources to help them find relevant jobs. 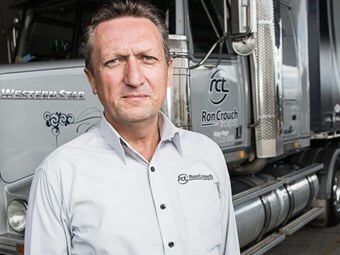 ATA vice chair and Ron Crouch Transport MD Geoff Crouch says ex-ADF personnel, particularly those who served in the military’s logistics unit, have a range of skills and experiences to offer to the transport industry. Crouch says his company has a 30-year history of employing former members of the defence forces. "The trucking industry is a natural partner for this program and the present driver shortage in the trucking industry demonstrates its potential to not just benefit ADF personnel but the wider economy," Crouch says. "These people are exceptionally valuable members of the workforce, and this is a result of the training the army provides to these professionals," Crouch says. "Knowing the skill and the commitment these people have, I wouldn’t hesitate to employ former members of the army. "I encourage businesses in the trucking industry to take advantage of this unique opportunity, and become a Veteran Employment Ambassador. "When our professional logistics people have completed their service in the ADF, there are great jobs available in the trucking industry." The subject of driver shortage in Australia has been addressed by Volvo and Isuzu, with the latter claiming that the situation has been exacerbated by lax industry attitude. Volvo’s recent report, Professional Truck Driver Shortage: How driver availability impacts the transport industry & Australian society, found that 46 per cent of Australian trucking operators surveyed experienced a shortage of available drivers, and 52 per cent have an issue attracting the quantity of drivers needed for their business. The federal government is encouraging business to partner with local ex-service organisations such as Returned & Services League (RSL) and Soldier On to kick-start the program. All participating businesses will be given the title of Veteran Employment Ambassador. The Industry Advisory Committee (IAC) will help develop a criteria to judge valuable efforts made by small, medium and large businesses to be recognised at an annual awards event – Prime Minister’s Veterans Employment Annual Awards. For more information about the program, visit the Department of Veterans’ Affairs website.